The Gulf Centre for Human Rights (GCHR) very sadly received reports from reliable sources inside Syria confirming that on 09 November 2012 human rights defender, and member of the Syrian Center for Media and Freedom of Expression (SCM) Ayham Moustafa Ghazoul died after being severely tortured. Ayham Ghazoul was first arrested and held incommunicado by Air Force Intelligence on 16 February 2012 together with 15 other persons including leading human rights defender, Mazen Darwish, head of the (SCM), during a raid on their Damascus offices. On 22 April 2012 he was presented to the Military Prosecutor in Damascus, who informed him that he will be prosecuted by a military court for “possessing prohibited materials with the intent to disseminate them.” He was released after he spent 87 days in detention. According to reliable sources, on 05 November 2012, some members of the pro-government National Students Union captured Ayham, together with two other students at the entrance of Damascus University. They turned him in to the Air Force Intelligence in Mezze after brutally beating him. He suffered from internal bleeding after being tortured by members of the Air Force Intelligence, and died on his fourth day of the unlawful arrest. He was born in 1987, a dentist and a MSc student from Deir Atteih city. He was well known for his peaceful human rights activities. 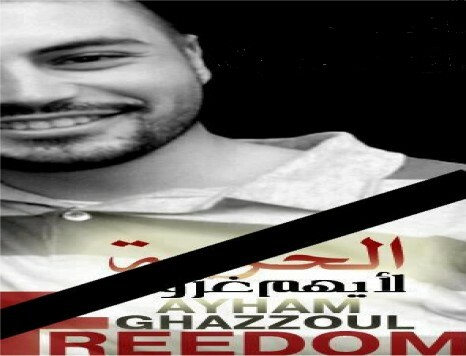 The GCHR believes that Ayham Moustafa Ghazoul has been solely targeted and killed as a result of his peaceful activities in the defense of human rights, in particular, his work to defend the freedom of expression in Syria. 4. Guarantee in all circumstances that all human rights defenders in Syria are able to carry out their legitimate human rights activities without fear of reprisals and free of all restrictions including judicial harassment.